Happy Friday! 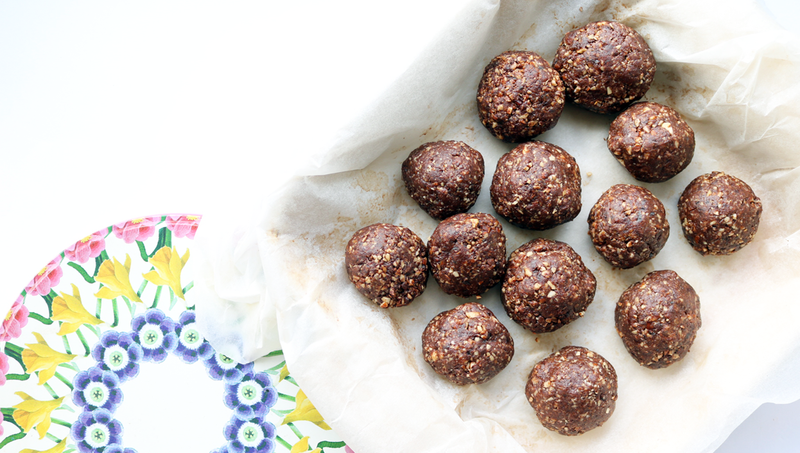 For this week's Foodie Friday post, I wanted to share one of my favourite recipes by Deliciously Ella and show you how easy it is to make these delicious Cacao & Almond Energy Balls at home. 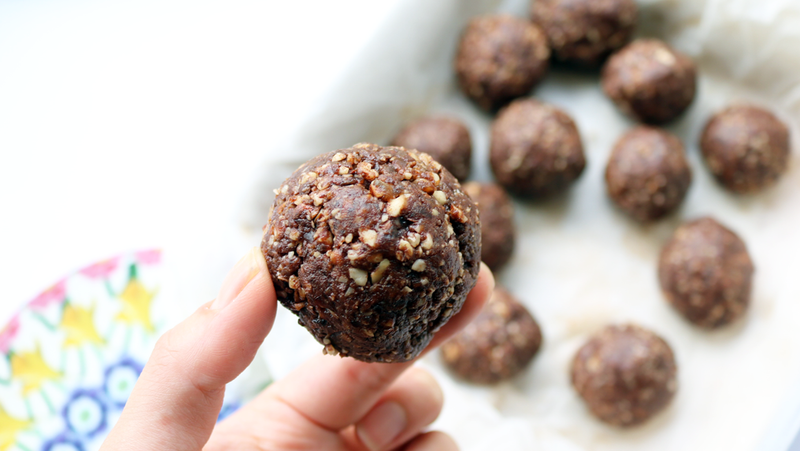 These are perfect as a post-gym/workout snack or just as a healthier, refined-sugar free alternative to reach for when that afternoon energy slump happens! I've stuck mostly to Deliciously Ella's original recipe, but I have added slightly more Almonds to up the protein percentage, as I personally like to grab one of these when I've finished a workout. I love to make these at the weekend in advance of a busy week, and they'll happily keep in the fridge for about a month in an airtight container. Place the Almonds into a food processor and pulse until they are chopped into small pieces. Add the Medjool Dates and Coconut Oil, and mix until thoroughly combined. Next, add the Almond Butter and Raw Cacao Power along with the pinch of Salt, and blend everything again until it looks like a thick paste mixture. Take a tablespoon of the mixture into your hands and roll into a ball. Set aside on a plate lined with greaseproof paper and continue making balls until all the mixture is used up. Depending on the size that you want, you'll probably end up with around 10-12 balls in total. Pop the rolled balls on the plate into the freezer for about an hour to firm up, and then transfer to the fridge into an airtight container. They will soften up again but should retain a firm ball shape. Enjoy! 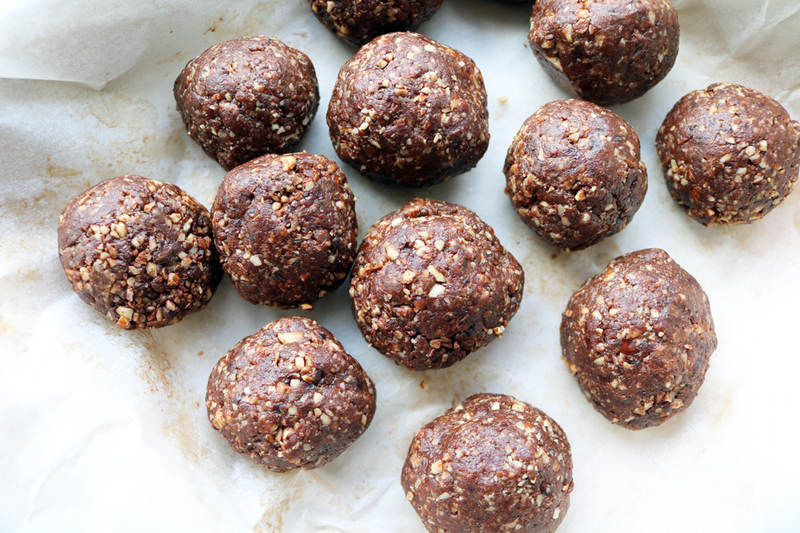 Have you tried making your own Energy / Bliss Balls?